Some things are just meant to be, especially when it comes to dessert. 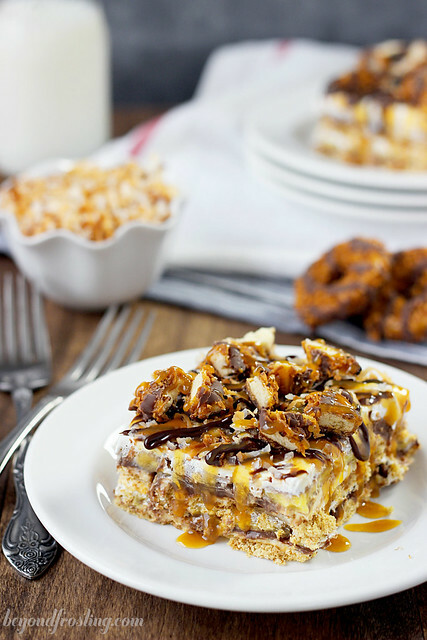 Things like this Samoa Icebox Cake are definitely meant to be. 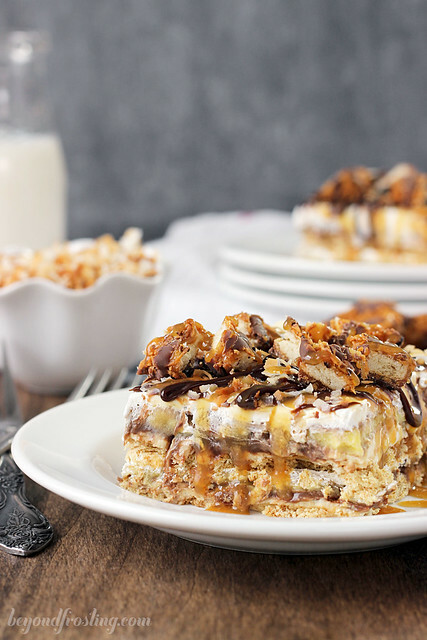 Layers of graham cracker, caramel cream cheese, coconut pudding and chocolate fudge are just a few reasons why this icebox cake will knock your socks off. 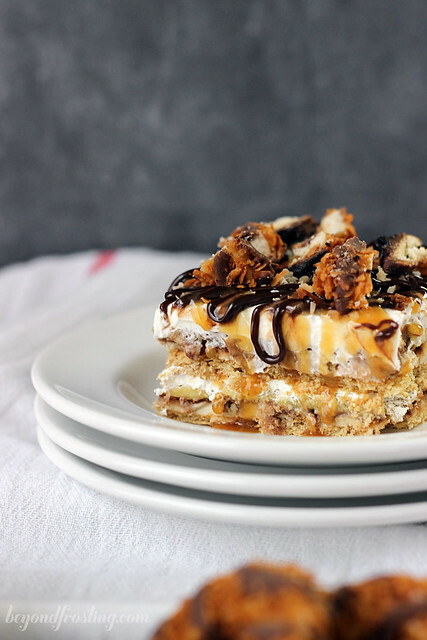 I originally set out to make a samoa lasagna, but decided on an icebox cake instead. They are quite similar, but there are less layers in the icebox cake and a little less of the filling. 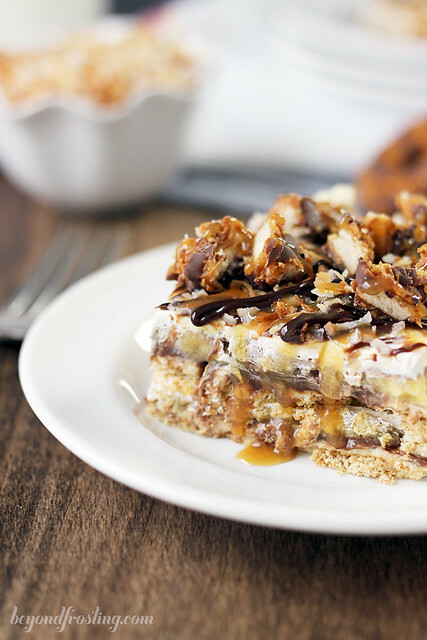 This Samoa Icebox Cake is next level delicious. Here is just a few dreamy layers of this icebox cake: graham cracker, caramel cream cheese, coconut pudding, chocolate fudge and toasted coconut. Also Cool Whip, let’s not forget about that! When is comes to icebox cakes, you can pretty much customize it any way you want. You could use shortbread cookies instead of graham crackers, or maybe even Brownie Brittle for some added chocolate. 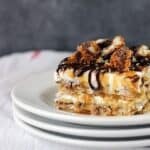 The ingredients in this icebox cake are very similar to those used in my Sinful Samoa Cake that I shared on Monday. Be sure not to miss that! It’s take a bit of finesse to build the layers. Start by lining the bottom of your pan with parchment paper or tin foil. This just helps to keep everything in tacked when serving, since the bottom layer of crackers won’t stick to the pan. Then you layer on some fudge sauce. I typically use a jar of Hershey’s Hot Fudge sauce that you would find next to the ice cream. It is very soft, and thus, very easy to spread. You don’t even really need to heat it up. Use an offset spatula to spread it over the graham crackers. You will need to get your fingers in there and hold down some of the crackers initially, but this is the “glue” that holds them together, so once that layer is on there, it will be easy to build the rest. Then spread on the caramel cream cheese. Since you will have tow layers, you will want to divide the cream cheese in half. On top of the cream cheese, I put half the batch of coconut pudding. Sometimes I buy coconut pudding at Walmart, but if I can’t find it, then I just make my own. You can simply use a package of vanilla pudding and add some coconut extract. It is delightful. On top of that I sprinkle some toasted coconut and repeat from the beginning. Of course you will want to top off your final layer with Cool Whip and lots of caramel and chocolate drizzle. I happened to have a few leftover Samoa cookies that I cut up and put on top. I know it’s difficult to have “leftover” samosa, but this is my trick to avoid eating them all. 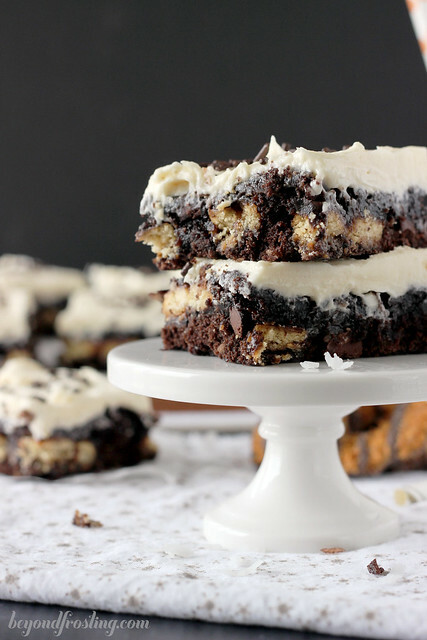 The best thing about icebox cakes is that they can be made ahead of time. The graham crackers will soften but it’s actually preferable! That way the texture of the cake is consistent and all the layers hold together. 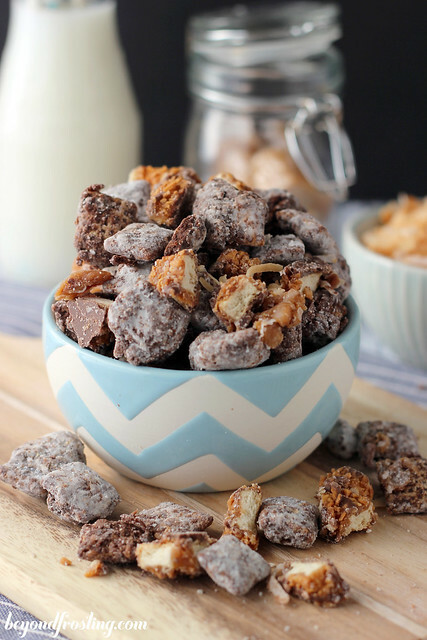 This recipe is mostly a no-bake recipe, except if you want the toasted coconut. This step is really easy. Turn on your oven to 400° F and spread the coconut on a baking sheet. I find it best to line the sheet with parchment paper or a Silpat Nonstick Baking Mat . You just have to bake it until the coconut turns a light brown and then remove from the oven and let it cool. I wish stores would start selling toasted coconut, that would be amazing! 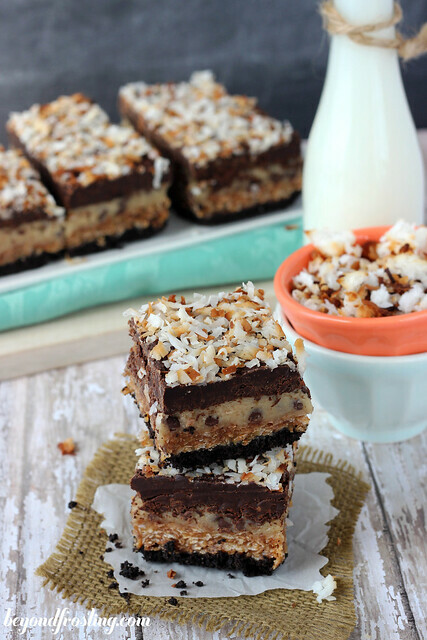 This samoa cake will be an awesome recipe to have on hand for those summer months when the temperatures rise and you are looking for a treat to cool you down. 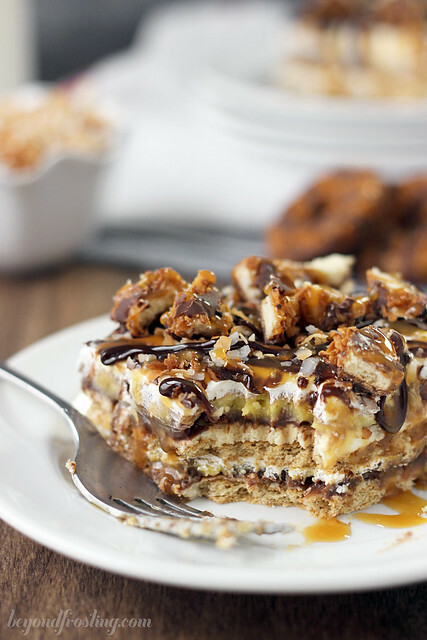 This Samoa Icebox Cake is all you have been dreaming of. Here is just a few layers of this icebox cake: graham cracker, caramel cream cheese, coconut pudding, chocolate fudge and toasted coconut. All topped with Cool Whip, more chocolate and caramel, plus Samoa cookies! Allow Cool Whip to thaw to room temperature. Preheat oven to 400°F. Toast coconut until lightly brown 10-15 minutes. It is best to toast on a baking sheet line with parchment paper. Allow cream cheese to soften to room temperature or microwave for 15 seconds. Don’t forget to remove the wrapper! Beat cream cheese on medium-high speed until light and fluffy. Scrap down the sides of the bowl. Add powdered sugar and beat into cream cheese. Add heavy whipping cream and caramel. Start at a low speed until the heavy cream is incorporated and then increase speed to medium high. Whip for 2-3 minutes until smooth. In a medium sized bowl, combine coconut pudding (if you don’t have Coconut pudding, use vanilla pudding and add 1 tsp Coconut extract) and milk. Refrigerate 5-10 minutes until pudding is firm. To build the icebox cake, lay a piece of parchment paper on the bottom or wrap the pan in tin foil. Lay out graham crackers to cover the bottom of the pan. For one edge, you will need to break the graham crackers apart. Use an offset spatula and spread a layer of the fudge sauce over the graham crackers. You will need to use your fingers to hold the crackers together until you get this layer down. Then spread a layer of caramel cream cheese on top of the fudge sauce. You should use half of what you have. Sprinkle toasted coconut on top and gently press into cream cheese. Finish the layer by spreading half the coconut pudding on top. Spread evenly. Continue to build with another layer of graham crackers. Spread another layer of chocolate fudge sauce followed by remaining cream cheese mix, toasted coconut and coconut pudding. Top the icebox cake with Cool Whip. 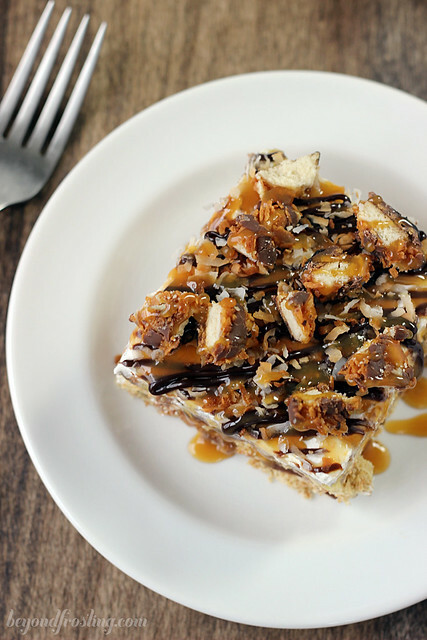 Drizzle with leftover caramel sauce, fudge sauce and toasted coconut. 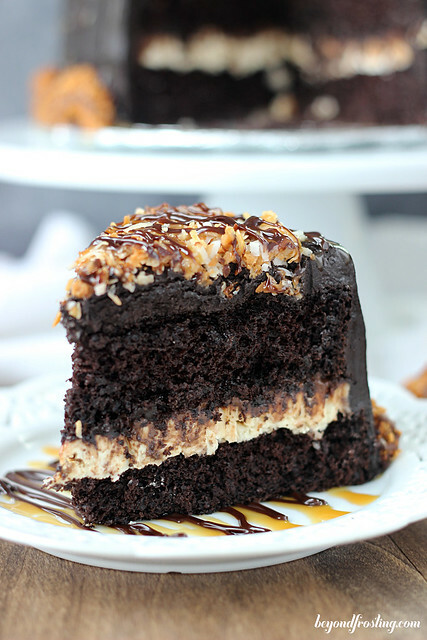 Cut some Samoa cookies into pieces and sprinkle on top of the cake. Cake must stay refrigerated and can be prepared a day in advance. Please watch coconut carefully- baking (toasting) times will always vary depending on the quality and moisture in the coconut. 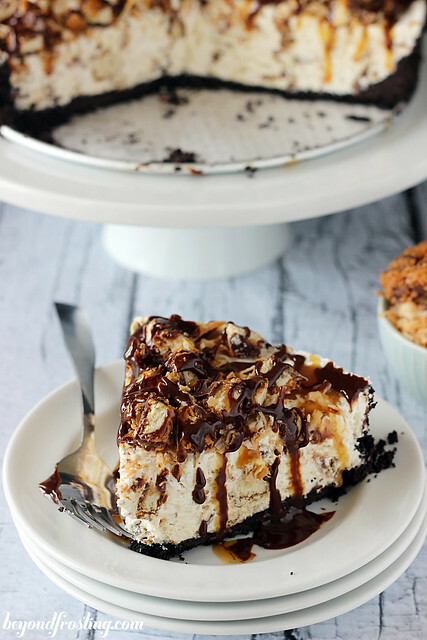 What size pan does this Samoa Icebox Cake call for? It must be a larger size considering it should serve 16-20 portions. Waiting for your response so I can make the right sized cake for the listed ingredients…can’t wait, sounds yummy!! My mouth was watering just looking at the pictures. This looks amazing.